Last Thursday (6 April) Silversea’s brand new Silver Muse docked at Tarragona, the opportunity for guests and media on its shakedown cruise to participate in the grand opening of Ferrari Land, which joins the Abu Dhabi extravaganza as the second branded Ferrari theme park. It was not a coincidence but a well-planned and very Italian occasion hosted by Spain. 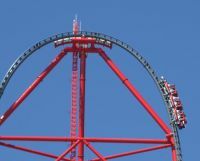 Ferrari Land is the latest addition to PortAventura Park, first opened in 1995 and with four million visitors a year Spain’s most popular attraction of its type. The park features five theme areas focussing on civilizations (Mediterranean, Far West, México, China and Polynesia), and one special zone based on Sesame Street, which was opened for the 2011 season. Actually within the development is the PortAventura Hotel, 500 rooms, with its abundant swimming pools and restaurants around a glorious lakeside setting. A Convention Centre is also part of the complex. 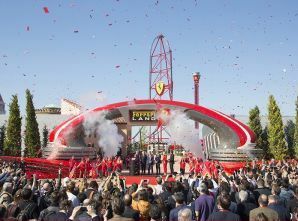 It played to host to a busy press conference prior to the official opening of the new park by Enzo Ferrari’s son Piero. On hand also were Silversea Chairman Manfred Lefebvre and CEO Roberto Martinoli plus 350 guests from the ship. The park represents a tribute to the genius of Enzo Ferrari, to the lifestyle he created and the iconic red cars, symbols of speed, technology and innovation. 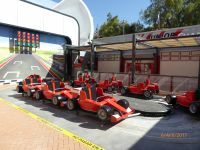 One of the major themes of Ferrari Land is to simulate what it is like to drive a Formula 1 car, and watch others doing the same. The 368ft high Red Force roller coaster accelerates riders from zero to 112mph in five seconds with a force of 1.3g. “You will feel what it's like to drive a Ferrari,” test driver Mark Gené, told the opening day crowd. In a nice touch, a grandstand has been built alongside the track, building the sense of spectacle for both participators and audience. There are a pair of what are termed Thrill Towers 180ft high offering free-fall and bounce-back experiences. The Maranello Grand Race lets families compete in a 600 yard long mini racing circuit. A Junior Championship Speedway for younger children, F1 racing simulators and a Pit Stop Record challenge are some of the other attractions. On the visual side of things on offer is an acrobatic show of gymnasts, jumpers, and what is termed ‘acrobatic basketball’. Plus BMX. For those who prefer the quieter life but are interested in the unique brand the Ferrari Gallery is an impressive space inside Ferrari Experience where visitors can enjoy an interactive tours and learn more about the legendary Ferrari Team, The Scuderia. It is interesting to try and remember the names of drivers long gone but Juan Manuel Fangio does stand out. No photo of Stirling Moss as far as can be seen but perhaps the 1955 Mille Miglia win in a Mercedes-Benz still rankles. Nor John Surtees the only man (and in a Ferrari) too, able to win a world championship on two wheels and four). The overall setting is what we might call ‘mock Italian’ a sort of reproduction of a Renaissance Italian town, complete with ornate piazzas, the tower from Florence and part of Rome’s Coliseum thrown in for good measure. Every day it is planned that an entourage of street entertainers will keep the park humming with song and dance plus traditional Italian fanfares, flags and acrobatics. Food is part of the day out for Europeans and visitors will not be disappointed from a selection of upmarket trattoria to very much basic hot dogs and sandwiches. Ferrari World has not had to work too hard for names for each eatery. Pit-lane, Paddock, stop&go, Fast Lap and Finish Line. Monza does not get a mention but if you name one Grand Prix motor racing circuit perhaps all have to be noted. Naturally there is a shop for Ferrari memorabilia and on display was a 488GTB. But in black. Someone got it wrong. All Ferraris should be in red. Prices start from €60 for the whole complex but there are discounts available if you are staying in one of the PortAventura Park hotels and with younger children in mind large families can visit PortAventura Park for only €155 or if you prefer an adventure in PortAventura Caribe Aquatic Park, admission is just €80. For PortAventura Hotel residents Ferrari Land is priced at €35, the rest of PortAventura part of your package. There are a further four hotels linked to the site.